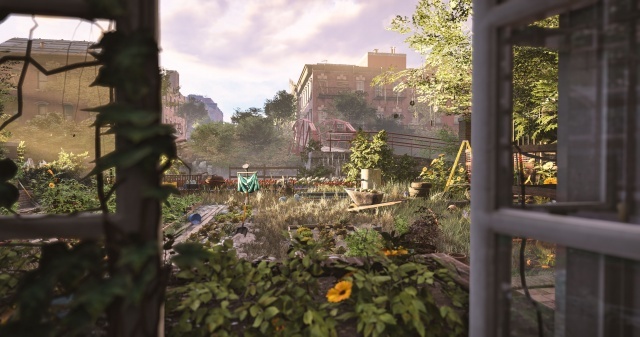 A look at The Division 2 after playing through some of its opening and end game content. Ubisoft recently debuted the campaign gameplay for The Division 2 at an event at The Hibernia in San Francisco. Attendees were given their briefing before each session in the former bank's basement which was converted into a post-apocalyptic presidential press room. The bank's main floor was covered with game stations arranged in pods of four so everyone could easily squad-up, while the surrounding area was filled with briefing boards with situation reports and tactical plans. Gameplay was divided into two long sessions, the first beginning at the game's opening, and the other focusing on end-game content with characters at the max level and loaded with high-end gear. These are the same segments of the game that will be available during the game's private closed beta which will launch on February 7th. Before I get into the gameplay, though, let's take a look at higher level look at the game. The Division 2 is set seven months after the first game. America is falling apart in the wake of the outbreak, and The Division is doing its best to keep it together. The Division receives a distress call from DC, and immediately moves into the city knowing that if DC falls, America falls. The stakes have never been higher and you need to be an agent of change as you restore order to the nation's capital. Your first order of business is to retake the White House and use it as your base of operations as you work to bring the city under control. There are three major factions trying to exert control, the Outcasts, Hyenas, and True Sons, each of which has its own philosophy, agenda, and tactics. As you complete missions, fight the factions trying to tear it apart, and help the civilians to get back on their feet, the city will reflect your success. Your base of operations will expand and gain additional facilities, and you'll see civilian camps become more populated and vendors set-up their shops there. The streets around your base and the civilian encampments will become safer, and you'll be less likely to run into enemy faction patrols. In order to take back the city you'll need to reclaim it a neighborhood at a time, and taking the strongholds and control points in those areas is the key to establishing control. Taking a control point will be tough, but you'll gain access to new resources and DC will become just a little bit safer. Fail and leave a neighborhood to the factions and you'll see the city suffer for it. The game opens as The Division arrives in DC. Your first order of business will be to liberate the White House in the game's opening mission (The Dawn's Early Light), and it's a mission that you will need to complete solo. The first thing that you'll notice is that the past seven months have been hard on the city. The developers spent a lot of time meticulously recreating the city from GPS and LIDAR data ... and then proceeded to destroy it. Wrecked vehicles litter the area, makeshift fortifications are everywhere, and the local plant life is aggressively reclaiming the city. Once you've secured the White House, you can immediately start using it as your base of operations. It's where you'll be able to buy and sell gear, level-up your soldier, and craft weapon mods. Right away you'll be able to unlock your first piece of equipment, either a remote turret, seeker mine, or protective drone. When you use equipment in a fight, you'll also be able to use the bumper triggers to select their targets. They'll act autonomously if you don't give them a target order, but it's nice to be able to concentrate your fire on the biggest threat at the moment. There are also plenty of weapons and pieces of armor available in the game, and part of the fun is seeing what loot you've managed to collect during a mission. When you're ready to venture out you'll be in The Division 2's persistent online world along with other players. Your first order of business is to visit the closest settlement in the Theater District and make contact with its leader, Odessa Sawyer. Once you do a big favor for her, the settlement becomes a forward base of operations for you and it will continue to grow as you secure the surrounding area. How you go about that it up to you, as it's your choice as to which missions you want to take on or strongholds you assault, or if you just want to patrol the area to stop public executions, interdict enemy patrols, and disrupt other faction activities. Even when you decide what to tackle next and are following the path to your waypoint, it's easy to be distracted by enemy encounters or newly discovered locations along the way. I had hours to play through the content in the Theater District and didn't come close to completing it all. The second half of the session focused on end-game content. Our soldiers were kicked up to the level cap of 30 and each one was given a specialty, either Survivalist, Sharpshooter, or Demolitionist. Your specialty gives you access to a high-powered special weapon, a crossbow, sniper rifle, or grenade launcher, respectively, and each specialty will have access to its own tech trees. These weapons require special ammo that's hard to come by, but if you manage their use carefully they can turn the tide of a fight when you're in a tight spot. I picked Sharpshooter, and that sniper rifle proved to be a valuable asset in the end game missions. The end game begins after you retake the Capitol, after which you'll open up the map to the end game. The end game will introduce you to the game's fourth faction, the Black Tusks, as it invades the entire map. The Black Tusks is a group that relies on high-tech firepower and is a formidable foe. End game content will feature three episodes of narrative content a year, eight-player raids, and all of the same type of content that was released for The Division's end game to date. My squad faced them in two of the end game Invaded missions, one set in what's left of the Air & Space Museum and the other in the remains of a Cold War era bunker. Both missions were challenging and provided for different types of battles. The museum galleries provided for large open areas with multiple levels while the bunker featured claustrophobic room-to-room fighting. Both missions were challenging, and took our squad at least forty minutes to complete. You'll be able to play all of the content that I did if you participate in the Private Demo, and you'll see that it covers only a small fraction of the game. There's a lot packed into The Division 2, and Ubisoft plans to continue to support the game for some time to come, with free updates that will be available to everyone who owns the game. For more information on the beta, visit ^http://thedivisiongame.com/beta^.